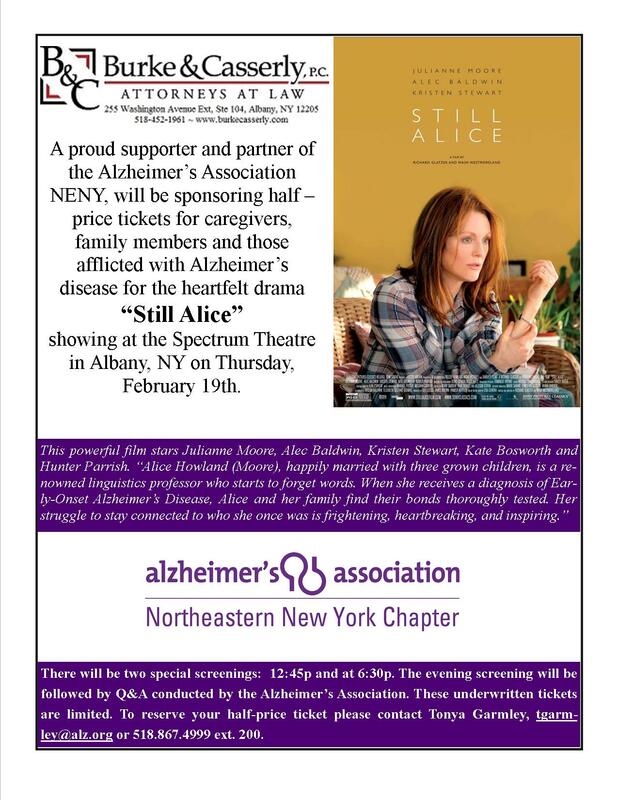 Burke & Casserly, P.C., a proud supporter and partner of the Alzheimer’s Association NENY, will be sponsoring half –price tickets for caregivers, family members and those afflicted with Alzheimer’s disease for the heartfelt drama “Still Alice” showing at the Spectrum Theatre in Albany, NY on Thursday, February 19th. This powerful film stars Julianne Moore, Alec Baldwin, Kristen Stewart, Kate Bosworth and Hunter Parrish. “Alice Howland (Moore), happily married with three grown children, is a renowned linguistics professor who starts to forget words. When she receives a diagnosis of Early-Onset Alzheimer’s Disease, Alice and her family find their bonds thoroughly tested. Her struggle to stay connected to who she once was is frightening, heartbreaking, and inspiring.” Burke & Casserly, P.C. is pleased to help enable the community to see this inspirational film. There will be two special screenings: 12:45p and at 6:30p. The evening screening will be followed by Q&A conducted by the Alzheimer’s Association. These underwritten tickets are limited. To reserve your half-price ticket please contact Tonya Garmley, tgarmley@alz.org or 518.867.4999 ext. 200. Click here for flyer!